International Management Institute,Delhi,Admission, Courses, Fees, Photos and Campus Video, Review, Ranking Details. First corporate sponsored Business School in India with sponsorship from corporate houses like Nestle, ITC, SAIL etc. International Management Institute, Delhi ,New Delhi was established in 1981 in collaboration with IMI Geneva (now IMD, Lausanne). It is India's first corporate sponsored Business School with sponsorship from corporate houses like RPG Enterprises, Nestle, ITC, SAIL, Tata Chemicals, BOC and Williamson Magor etc. 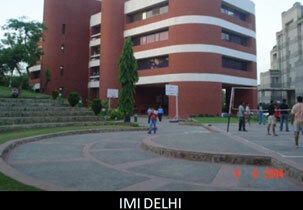 IMI Delhi has world-class infrastructure with several centers of excellence. It has received UNDP assistance for promoting internationally oriented management education and has international linkages with bodies like World Bank, UNDP, ILO, UNCTAD, Asian Productivity Organization etc. Besides this IMI is one of the empanelled Institute of the Ministry of External Affairs, GOI, for special Commonwealth Assistance Programme under which the Institute gets the executive MBA students from various Afro - Asian countries for its 15 months Executive Post Graduate Programme in Management. IMI courses have international curricula and are recognized by All India Council for Technical Education (AICTE) and Ministry of Human Resource Development, Govt. of India. IMI has strong alumni base of over 4,000 across the globe and across industries. Many of its alumni are occupying very senior positions as CEOs, Professors and Ministers. Fifth B-school in India to be accredited by globally renowned agency Association of MBAs (AMBA). Padma-Shri Dr. Pritam Singh - Director General of International Management Institute. Administrative Building and Lecture Halls - The centrally air-conditioned academic complex has spacious lecture halls, the Tata Chemicals Computer Centre, BOC Conference Room, auditorium, library, faculty chambers, executive training rooms and administrative Offices. All lecture halls have access to latest presentation equipment such as DLP Multimedia Projectors, Lap Top Notebook Computers, Electronic Copy Boards, OHP Projectors, Internet and Intranet Connectivity and a state-of-the-art Sound System. Williamson Magor Library - The Williamson Magor Library and Information Service is fully automated with about 22,000 books and 3,780 periodicals. Most journals are available electronically through the Business Source Complete [EBSCO], SAGE an Emerald databases. Auditorium - The Amphitheatre is the nodal point of campus life around which the academic block, residence and recreational facilities are located. There is an RPG Auditorium too. Computing facilities - IMI Delhi has wi-fi enabled campus and a network of 400+ computers. The Tata Chemicals Computer Centre has five servers (IBM, HP) with Windows 2003, Windows 2000, Windows NT and Linux as the operating environments. IMI Campus has two exclusive high-tech computer labs too with more than 100 (HP) computers. Established in collaboration with IMI Geneva (now known as IMD Lausanne) from Switzerland, IMI India has strong linkages with several other prestigious universities and B-schools worldwide.